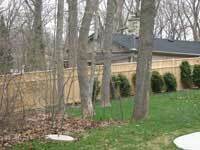 A wood privacy fence is a great way to protect your home and family, especially if you have children or animals. Children can play without fear that they will wonder off or that someone will harm them, and you can keep animals without worrying whether or not they’ll run off. Privacy fences also offer peace of mind by making it harder for a criminal to gather information about, or gain access to, your property. This means that your home is much safer. Wood is a popular choice for privacy fences, especially the high-quality, beautiful, Northern White Cedar that our fence company uses exclusively. You have to choose more than your materials, however: you have to choose your style, too. 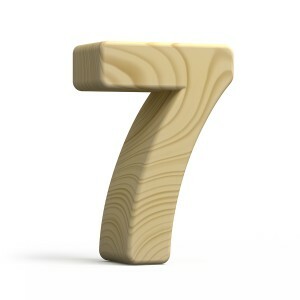 There are 7 basic types of wood privacy fences you’ll find in the Milwaukee area of Wisconsin. A board on board fence looks attractive on both sides of the fence because boards alternate to either side of the central rail. 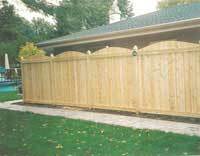 Though boards are often tightly placed to eliminate gaps this type of fence offers a way for breezes to pass gently into the yard, as well. 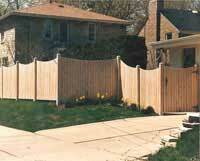 A rounded-top fence that is attractive and stylish. This fence style offers a “rolling wave” look that can be very soothing. 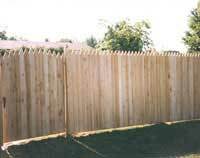 Uniform fences that are good for unusual property shapes because the uniformity of the pickets allows the fence contractor to modify the sections to fit your yard without breaking the flow of the fence on the “neighbor” side. Dog Eared fences also offer a lot of variety as far as the style of the top of the fence goes. Lattice fences are extremely attractive and friendly to landscaping efforts. A tight pattern keeps you from feeling as though you are living inside of a fortress while continuing to offer real privacy by showing off very little. These fences offer an elegant, uniform look. They do a great job of following the smooth, rolling lines of a property boundary while showing off their exquisite craftsmanship. 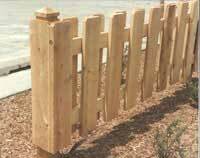 These plank fences are even smoother and more elegant than lock-board fences as there is nothing about the design to interrupt the smooth vertical flow of the wood. This creates clean lines and a sense of sturdy pride that few fence styles can match. The jagged tops of the stockade fence make it an extremely secure option, offering discouragement to any potential climbers. The security does come, somewhat, at the expense of the fence’s decorative qualities. 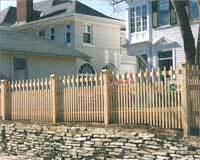 Picket fences are traditionally associated with warm, happy homes. This fence keeps children and animals safe while giving your property a more inviting look. When it comes to choosing a fence style, we can help! Meeting with a fence contractor can help you determine which of the fence styles will be a good match for your home while meeting all of your needs. Contact us online or give us a call at (262) 251-6766. We can give you a free estimate too if you’re interested! 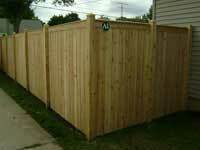 Wood privacy fences are an important component of a house especially one in the urban community. A well-chosen and appropriately-designed fence affords homeowners the pleasure of enjoying their private space without necessarily giving the impression of being an unfriendly neighbor.